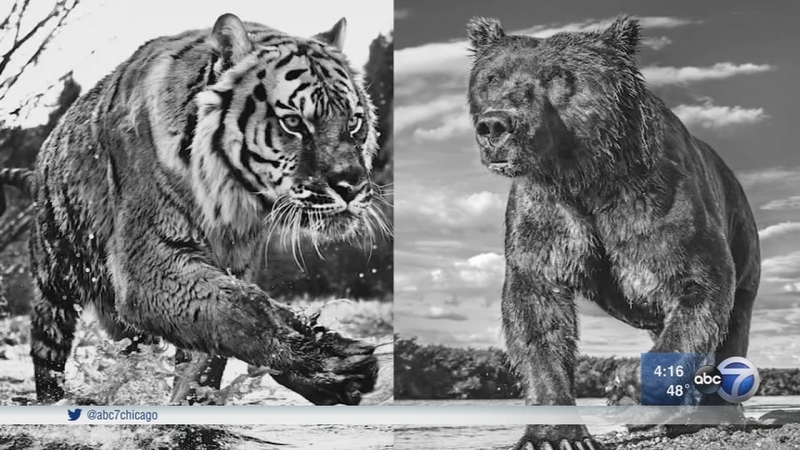 CHICAGO (WLS) -- David Yarrow is a wildlife photographer who's acclaimed around the world for his artistry and conservation efforts. Yarrow's "Wild Encounters" exhibit just opened in River North at the Hilton Asmus Contemporary Gallery. Each creature is achingly resplendent and stately. The photographer felt lost in a previous career of finance. In nature, he found his calling, and success. "It just hit me more in terms of a sense of accomplishment and fulfillment. The idea of taking a picture someone's willing to spend $60,000 on is kind of far-fetched idea particularly when I started selling pictures I would sell them for $20," Yarrow said. "Animals are much easier to work with than people, animals are very predictable, they're lazy and animals can't get drunk. My most dangerous moments are with people that can get drunk, can get high and get AK 47s." But some people make the cut, and with humor! But it's the creatures that always steal the scene. Yarrow is known to his fans for his wildlife photography, but recently, he was invited to North Korea to shoot rural daily life. You can see "Wild Encounters" at Hilton Asmus Contemporary through mid-January. "We only live once, none of us is getting out of here alive, might as well give it a good shot," he said.